Harriet Berkowitz followed through on her promise and yesterday I received her package containing about 20 photocopies of her family photographs. 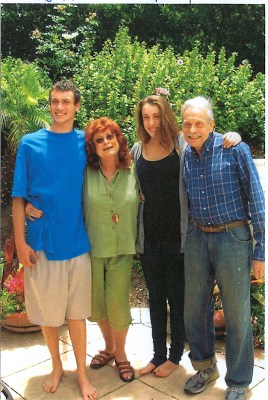 In many cases, these are the first photos we have seen of Rabinowitz family members. 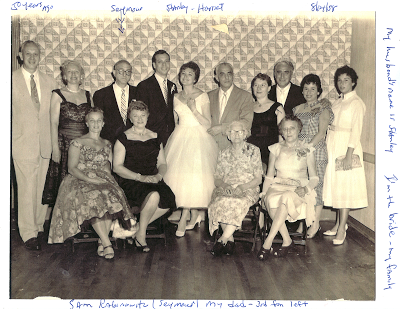 There are also new photos of our father and his parents that are new to us, plus the promised invitation to Stanley Ruby's bar mitzvah. Together they begin to paint a fuller picture of the Rabinowitz family. It is going to take me a few days to get the images all scanned and processed. Here is a start. Click on the images to enlarge. 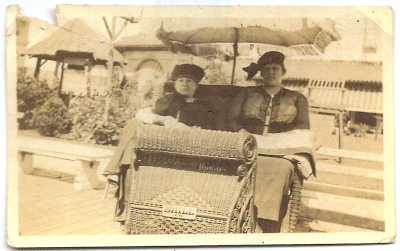 Lena Rabinowitz with Arthur's wife Anne, apparently at a beach club. Brothers Henry (also called H.V. 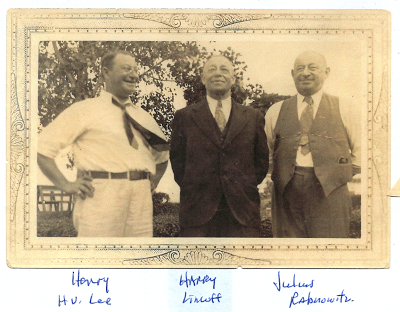 Lee) and Julius Rabinowitz flank their cousin Harry Lincoff. 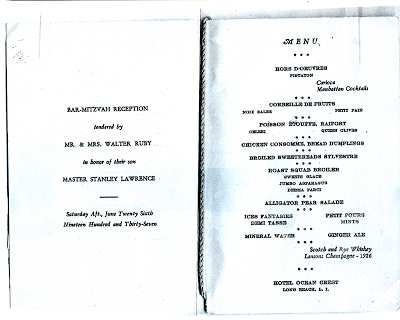 Invitation with elaborate menu for Stanley Ruby's bar mitzvah in 1937 at the Hotel Ocean Crest in Long Beach. The menu even includes liquor brand selections, such as Carioca rum served with hors d'ouevres. Update: Walter has translations for the Hebrew names above the "Dear Mother" and "Dear Father" inscriptions. 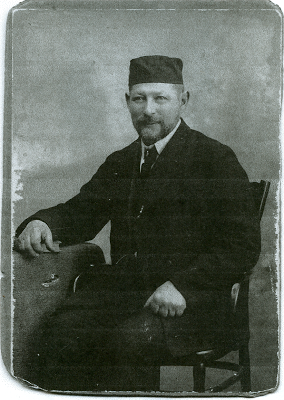 The information sheds doubt on the Rabbi Spektor theory of Joseph's genealogy, though multiple questions remain to be answered. On Joseph's side, the Hebrew reads "Dear Father, Reb Yehuda, son of Abraham .... On Lena's side, it reads "Dear Mother, Rachel Leah, daughter of Abraham.... This is the first we have seen the names Yehuda and Rachel. Abraham does not match with the theory that Joseph was the grandchild of Rabbi Spektor. In that scenario, the father should have been Chaim or possibly Aryeh. Somehow on my first several perusals of Harriet's trove of Rabinowitz materials I missed the most important page. Two of the pages were stuck together in my pile and until just now overlooked the following commemorative document recognizing the Yahrzeit for Lena and Joseph. 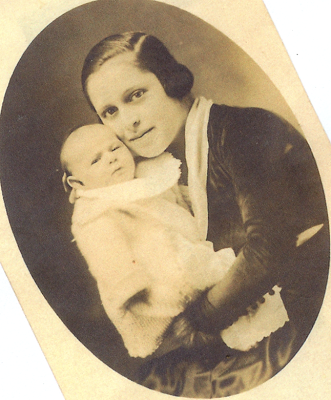 What is so important about it is that it provides exact dates of death for our great grandfather and great grandmother, which will finally allow us to track down their New York City death certificates, which we expect will lead us to their burial sites and also provide parent names and other information. 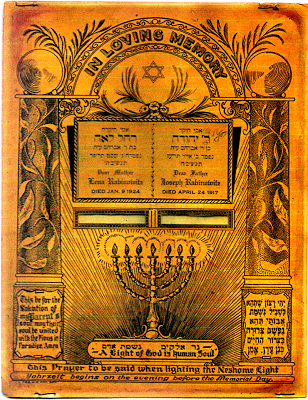 Here is the Yahrzeit scroll. Click to enlarge. Hebrew translations welcome. These first two photos are from just two weeks ago, when Harriet and her husband Stanley were visiting their daughter's family in Southern California. 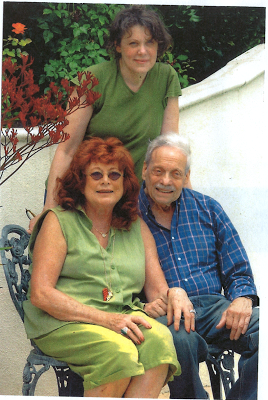 First, here are Harriet, Stanley and their daughter Hillary Cohen. Now we know who got the good Rabinowitz hair. Here are Harriet and Stanley with Hillary's children Julian and Avery. It is great to see a new generation of Rabinowitz offspring. I hope they get the chance to meet their third cousins Twyla, Gene, Zach and Elana sometime soon. 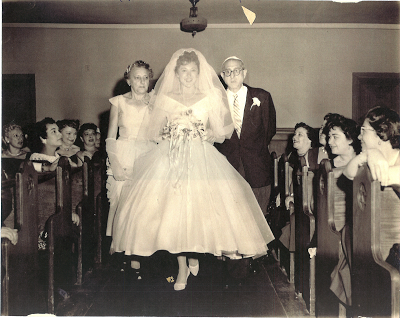 Now we go back 51 years to Harriet's wedding day on August 14, 1958. Here you see Sam (Seymour) Rabinowitz and Harriet's mother (we don't have her name yet) escorting Harriet down the aisle. And here are Harriet and Stanley looking radiant in a group photo with family members present for the occasion. Finally we have a few items of memorabilia from Seymour. 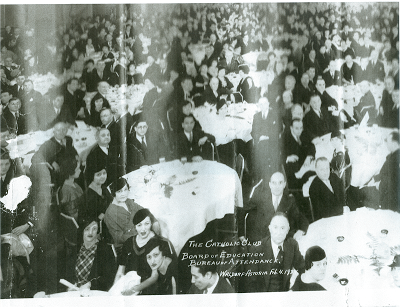 The first is a photo of a 1934 banquet at the Waldorf Astoria, a formal affair for the Board of Education, where Seymour worked for many years. 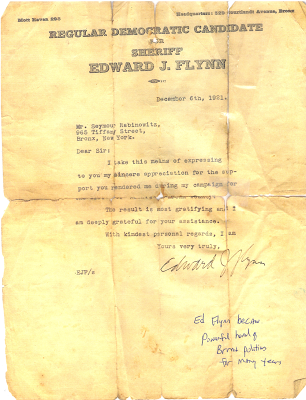 And finally a letter of appreciation written in 1921 to Seymour by Edward Flynn, the newly elected Sheriff of the County of Bronx. As Harriet notes in her annotation, Flynn became the so-called "Boss of the Bronx" and played an important role in state and national Democratic Party politics until his death in 1953. It is worth noting here, that the letter is addressed to the 965 Tiffany St. address that would be listed three years later as Lena's residence at the time of her death, not the 305 Tiffany St. address where a number of the family members lived 23 months earlier at the time of the 1920 census.